From left to right: Rishit Pendota, Caleb Suitor, Ayush Ghosh and Sahil Rao work together at the chess board station during the Key to Kindness exercise at Glen Oak Elementary School in Lewis Center on Tuesday. From left to right (front row): Kaden Pilkington, Nithya Kosike and Gabby Horning unlock one of the boxes as fellow classmates look on Tuesday at Glen Oak Elementary School in Lewis Center. Lessons in kindness were abundant at Glen Oak Elementary School in Lewis Center on Tuesday as students took part in a “Key to Kindness” exercise led by Guidance Counselor Jim Bickley. Each fifth-grade class will participate in the event, which features six different stations that include its own message about being kind to others. During Tuesday’s session, students were split into teams of four and were tasked with unlocking the message at each station. Each message was locked away in either a keyed or combination lockbox, forcing students to work together in order to receive the numbers or key and obtain each puzzle piece in the lockbox. Students were given 35 minutes to work through as many stations as possible, but Bickley said they would have the opportunity to finish all stations and reveal the final key to kindness in the next lesson. While no team has yet been able to complete all six stations in one day, the team of Isaiah Wallace, Anas Mohamud, Jackson Mount and Jayven Noble-Tanner completed five stations, which Bickley believed to be the most by any team for a single day. Stations included a crossword puzzle featuring kindness-related words, a chessboard where students must use the pieces to uncover letters, a dictionary search and sudoku. Bickley said the exercise was meant to resemble escape rooms, which have become popular sources of entertainment around the country. In the escape rooms, teams must work together to uncover clues in order to make it out of the room within the time limit. Bickley pointed out the teamwork aspect of the exercise is also important. Asked what she enjoyed the most about the exercise, Glen Oak student Nithya Kosike said, “We got to cooperate, and we didn’t fight.” Kaden Pilkington, who was a teammate of Kosike, said he enjoyed completing the task and getting the box opened. Addressing the students at the end of the exercise, Bickley asked what they had learned about kindness from the activities. Jackson Mount, one of the first students to offer a response, offered a simple, yet impactful answer: kindness matters. Bickley said he has been pleased with the exercise, which he held for the first time last year, and he hopes to organize something similar for the fourth-grade classes in the future. 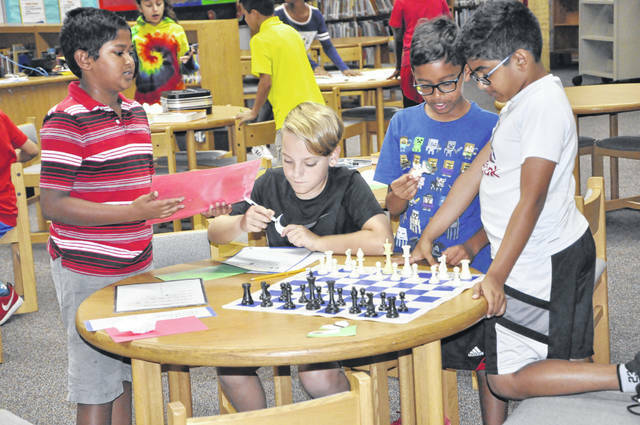 https://www.delgazette.com/wp-content/uploads/sites/40/2018/09/web1__DSC0083.jpgFrom left to right: Rishit Pendota, Caleb Suitor, Ayush Ghosh and Sahil Rao work together at the chess board station during the Key to Kindness exercise at Glen Oak Elementary School in Lewis Center on Tuesday. https://www.delgazette.com/wp-content/uploads/sites/40/2018/09/web1_Kindness.jpgFrom left to right (front row): Kaden Pilkington, Nithya Kosike and Gabby Horning unlock one of the boxes as fellow classmates look on Tuesday at Glen Oak Elementary School in Lewis Center.